My husband likes to brag that the homes he builds don’t ever have icicles. I know what he means, and I’ll explain. There is more than one cause for a home having icicles, and some of them are just related to weather. However, if you have a lot of icicles, all winter long, you should be looking at how much it is costing you to heat your home. When heat escapes your home, it melts the snow on your roof, and then it freezes again before it hits the ground. The higher your heating bill, the bigger your icicles. Still confused? 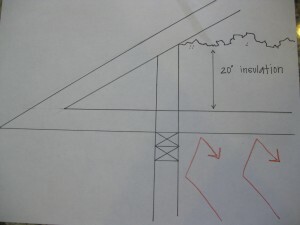 Let’s talk a minute about standard trusses verses cantilever trusses, and how they contribute (or prevent) heat loss. My husband builds all of his homes with cantilever trusses. In Star Valley, I think we have 9 months of winter and 3 months of summer. 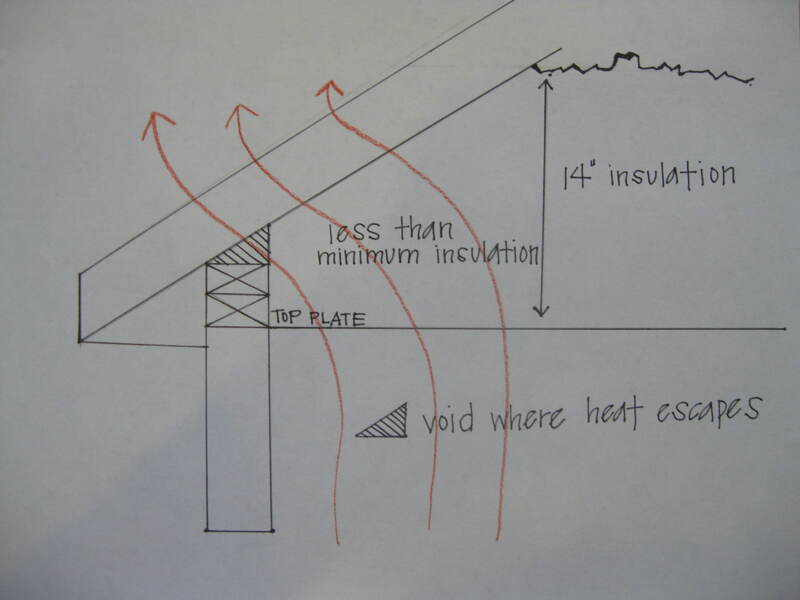 So we think a warm home is really important, and the cantilever truss vertually stops heat loss. I drew two pictures for you to see. This will help me explain my point. 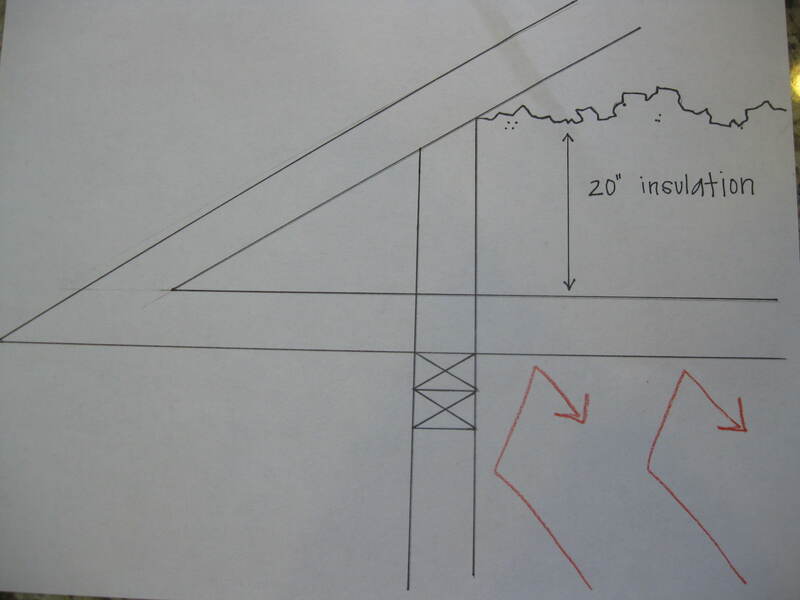 The first image is of a standard truss. This is what happens with a standard truss. Pay special attention to the simple notes I’ve written on the image. You’ll notice that there are 14 inches of insulation in the picture, which is what the code book requires in this area. As the roof gets closer to the outer wall, there isn’t enough space for the insulation to go. So to begin with, you can’t even get the minimum amount of insulation near the edges of your walls. 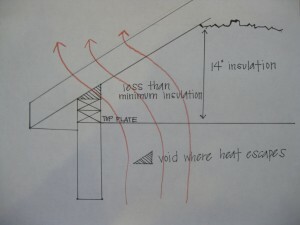 As you can see, a void is also left with no insulation, and heat leaves the home easily. Now here is a picture of a cantilever truss. This is a roof with an 8-12 pitch (don’t worry about what that means…it is just how steep the roof is). My husband loves to go well beyond the minimum, and in his homes he always puts 20 inches of insulation. The other wonderful thing that happens with this scenerio is that the 20 inches of insulation stays that way clear to the edge of the walls. And you can see by the way the truss sits on the wall, there are no voids for the heat to be able to escape. On NPR yesterday, it said that 80% of homes are underinsulated. You might not be able to change your roof, but do check the amount of insulation your home has. It could make a major difference in the money that leaves your home (literally) every month, and cut down on those icicles! If you have any questions about your home, feel free to send them via my contact page!